Why arXiv? For both new and seasoned researchers across disciplines, preprint repositories and other open access solutions can be an opportunity to quickly claim and share your results, increasing attention (and citations!) from a broader peer network. 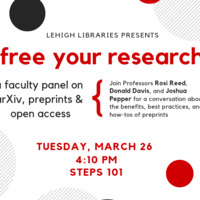 Join Professors Rosi Reed, Donald Davis, and Joshua Pepper for a discussion of benefits, best practices, and how and why Lehigh researchers choose to share their preprints.